We regret to advise that Heronfield is now CLOSED and thus unable to offer B&B accommodation to guests and visitors. Sorry for any inconvenience this causes to new enquirers. With the full moon on November 24 2007 startling images were once again fully visible when viewed across Loch Portree from our home. A Full Moon reflects over in the Loch and surroundng hills as viewed from our balcony. Portree Village across the bay from Heronfield. 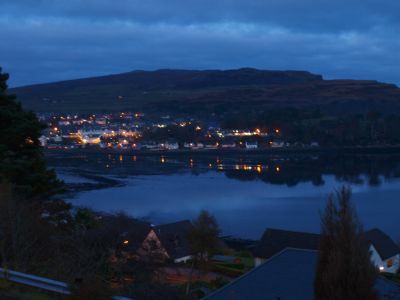 At dusk Portree's lights shine across from Bayfield and The Lump (where the Skye Highland Games are held every August).